This is along the same lines of the sentiment expressed in the HONG KONG LAUNDRY video. I know lots of people still have cars here despite how tiny the place is, but we do not have a car. I know if we really wanted to, I could alway go and buy a used car, but there really is no use for it. And I know that not driving is better for the environment, but I still can't help it. A part of me really misses driving. Believe it or not, even though we lived in NYC, we used our car a lot and depended on it to get around. I had a reverse commute that would have taken 1.5 hours each way on public transportation but was 30 minutes by car. And on wknds, we'd drive to Philly or to see my folks in upstate NY. Sure we could have taken public transportation but that would have turned a 2 hour trip to 5 hours (door-to-door) and a 1.5 hour trip to 3 hours (door-to-door). Here, our trips within HK are usually at most a little over an hour. There just aren't that many places to go. And there's no real possibility of doing a long-haul road trip like the ones So Jene and I used to do back in the U.S. (NY to Key West, NY to Savannah, CA to NY). 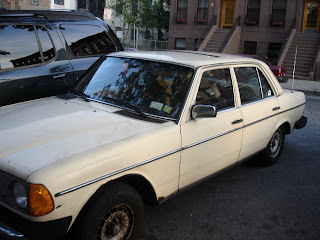 Anyway, I'm not a gearhead, and I'm not even that into cars (new flashy cars that you see so many well-to-do HK people in), but I do miss driving, especially in our last car, a 1984 Mercedes 300D, a diesel car that I personally rigged (by changing the plumbing and installing a second fuel tank in the trunk (a converted ice box)) to run on recycled vegetable oil that I used to go pick up from the CROWN FRIED CHICKEN establishment at the corner. Yes, folks! I was one of those people who ran their cars on recycled vegetable oil. It's a lot of work, and it's cumbersome, but it works. 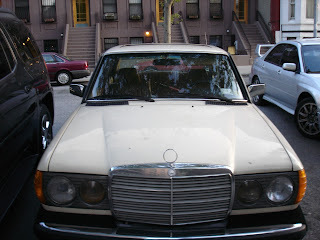 I drove that Mercedes on vegetable oil for around 7000 miles and then sold it right before we moved. So Jene used to hate how the exhaust would smell like fried food and did not at all appreciate how I had to keep a large barrel of recycled vegetable oil in the corner of our kitchen--what can I say? She's put up with a lot and is a saint. But she did like the leather seats, which were in good condition considering how old the car was. The entire conversion cost me around $250 U.S. in parts and lots of my own labor. They sell kits for around $1000, U.S. but I managed to do fine without the kit. I didn't get the kit because it was more expensive than the car. I looked into doing something similar here in Hong Kong. The tropical climate here would make it very easy to run diesel cars on vegetable oil as the main difficulty of doing so is cold weather. And I always see tons of those metal cubes of used vegetable oil piled up in backs of HK restaurants. But sadly, there are no diesel private cars here for whatever reason. Does anyone know?? Anyway, the photos here are of that car--I wish I had better photos but I took them only to post ads when I needed to sell. The car was an old jalopy that looked good only from about 50 feet away. I bought it from this old guy up in Scarsdale for $850 specifically to convert it to run on vegetable oil. The Mercedes Benz symbol hood ornament was so old that the inside had fallen off and was just a hoop. I hope this car is still on the road and still running strong on recycled vegetable oil. "I don't walk on your car, please don't park on my pavement"
Perhaps you can use your video skills to bring a few of these messages home. Cool. It's not a biggie. Hong Kong's being so tiny makes the decision easy. It's interesting how the riches most developed nations are returning to the bicycle (eg. Scandinavian countries, Japan) and those countries that are becoming or have just become rich are overridden with cars.